TVStreamNow Toolbar is one of the Mindspark family's potentially unwanted programs. The extension places a few icons on the browser and offers lists of movies, and TV series users can watch on various paid streaming web pages as well as links to popular web pages (e.g., Facebook). Moreover, the application might hijack Google Chrome or Mozilla Firefox by replacing their default new tab pages. It means the affected browser may open a tab with a particular website belonging to the potentially unwanted program when the user launches it. The problem with it is the extension’s website might offer an untrustworthy search engine that could inject gathered results with advertisements from unknown sources. Consequently, we advise not to take any chances by keeping TVStreamNow Toolbar installed. To learn more about it, you could read the rest of the article, and if you decide to eliminate it, you should have a look at the instructions located below. The extension is available on its official site (gettvstreamnow.com) as well as the Google Chrome Web Store page, but our specialists believe it could be promoted via pop-up advertisements too. Users could encounter such content on various file-sharing web pages. Needless to say, agreeing to install tools offered on annoying pop-ups or doubtful websites is always a bad idea. Before clicking the download button users should find some information about the suggested software that would help to decide whether it can be trusted, e.g., it is essential the software’s developer has a good reputation. 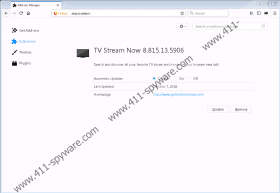 In this case, we cannot say TVStreamNow Toolbar developers are considered to be trustworthy as they have released a lot of similar potentially unwanted programs and browser hijackers. Talking about the extension’s working manner, some users may find its provided links useful, but surely these links can be bookmarked without having to keep TVStreamNow Toolbar to display them. The main reason we would not recommend using it is its offered search engine called mysearch.com. Our specialists say it could inject collected results with advertisements from unknown sources. Given they might come from various third parties, we suspect there is a chance some of them could promote other untrustworthy applications, fake lotteries, and so on. Therefore, it seems to us it would be best to save the links as we mentioned earlier and use a more reliable search engine for your new tab page than the one provided by TVStreamNow Toolbar. If you think the extension is not worthy of your trust as well and do not want to leave it on your browser, you should remove it at once. Users can delete the potentially unwanted program by going to their browsers’ Extensions menus. To make it easier for you to handle this task, our specialists have prepared steps explaining how to get rid of TVStreamNow Toolbar via Google Chrome and Mozilla Firefox as these are the browsers the application is compatible with. It is also possible to erase it with a reliable security tool. In such a case, you should pick a reputable tool worthy of your trust and scan the computer with it. Once the scan is over, you should find not only a list of potential threats but also a removal button that should delete all detections at the same time. Find the unwanted extension with this ID podgeadojmfnljiibabaddnebdodfbfd in the add-ons list. Click the Remove button next to the potentially unwanted program. Insert about:addons into the browser’s address bar. Find TV Stream Now and remove it. Close the Extensions menu tab.